Maccaferri’s renowned Terramesh System is a modular system used to form rock faced reinforced soil walls (also known as Mechanically Stabilised Earth) and embankments. It has been used globally on some of the most significant infrastructure schemes, including what is believed to be the tallest reinforced soil structure in the world; 74m high. Terramesh System units are made of high-quality double twsted steel wire mesh, which is heavily galvanized and polymer coated to provide long-term corrosion protection. An additional protective polymeric coating is also applied for gabions that are to be used in more aggressive environments, or where a longer design life is required. Gabions and Terramesh are often used in conjunction for soil reinforcement purposes forming more cost-effective hybrid structures. Therefore on many projects and solutions Maccaferri frequently combines more than one product to optimise solutions for clients. 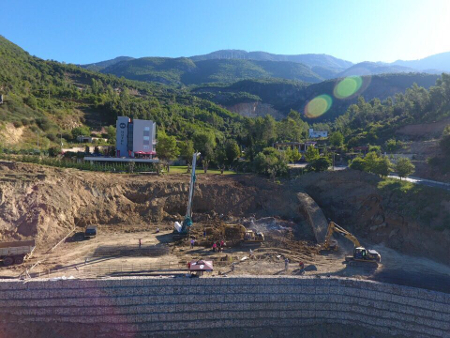 A recent project in Tirana, Albania, aptly exemplifies how these products can be used together—in this case, for the construction of a Soil Reinforcement Retaining Wall designed to protect a Hotel. Maccaferri Balkans recently developed and supplied a three tiered retaining wall and soil reinforcement wall located in the tourist area of Tirana on the Dajti Mountain. The base of the structure was constructed with gabions (8×10 mesh type) and is 6m in height and had a cross-sectional base width of 4m. The second and the third tiers of the structure are both made out of the Terramesh soil reinforcement system which for efficiency and ease of construction additionally used ParaLink geogrids a the primary soil reinforcement. The second reinforced soil wall is “L” shaped and measures 76m in length and approximately 12m in height. The third tier of the wall is a reinforced soil structure made up of a Terramesh System and has a length of 84m and a height of 8m. Due to its tall overall height, the design of the Terramesh structure also featured polymeric geogrids to supplement the existing integral geogrids of the Terramesh units. Additional soil reinforcement capacity was provided by Paralink 300 geogrids at the base of the structure and Macgrid EG 60.3 in the upper levels. The length of these polymer geogrids within the reinforced soil mass, measured up to 13m long. The purpose of this substantial retaining structure was to protect and maintain the Hotel and the reserved parking area. Additionally, the structure is supposed to shield the pool that is currently still being planned, and the parts of the road that surround the hotel area. Maccaferri supported the client in the design process, assessing the conditions and including the seismic coefficients of the area as to design the best possible solution for the given circumstances.